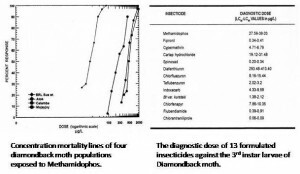 Variability in Response to Insecticides of Field Populations of Diamond Moth, Plutella xylostella (Linnaeus), in the Philippines. Philippine Entomologist, 24 (1): 39-76, April 2010. 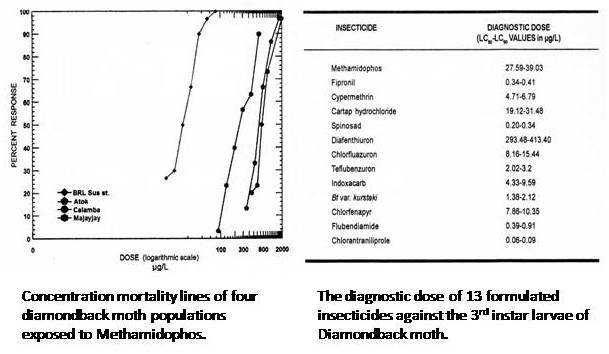 Three populations of the diamondback moth (DBM), Plutellaxylostella (Linnaeus), from crucifer-growing areas in the Philippines were tested for susceptibility to 14 formulated insecticides. The leaf dip assay was used on third instar larvae of the pest. The 72-hr LC50 values were compared to those of a reference susceptible strain (BRL Susst). Computed resistance ratios for the three populations showed varied response in range and levels of resistance to the insecticides. The populations from Atok, Benguet (7400 fasl), Majayjay Laguna (1000 fasl) and Calamba Laguna (100fasl) still had very low level of resistance to new insecticide molecules such as flubendiamide, chlorantraniliprole, chlorfluazuron, chlorfenapyr and diafenthiuron, and to the microbial formulation Bacillus thuringiensisvarkurstaki. On the other hand, all three populations showed very high level of resistance to cypermethrin and to malathion. LC50 determination for malathion was discontinued when the populations showed no mortalities up to 3555ug/L. For the remaining test insecticides – cartap, indoxacarb, spinosad, fipronil, methamidophos and teflubenzuron – responses of the three populations in terms of LC50 values when compared to that of the reference population vary, ranging from very low to very high level.Discriminating doses (LC80-LC90 values) for the formulated insecticides are also proposed as input in development of insecticide resistance monitoring system for DBM. 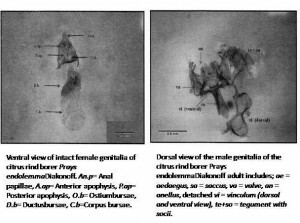 Field Biology, Setal Map and Adult Genitalia of the Citrus Rind Borer Prays endolemma Diakonoff (Lepidoptera: Yponomeutidae) on Pummelo Citrus maxima (Burm) Merr. (Rutaceae) in Region XI, Philippines. Philippine Entomologist, 26 (1): 62-92, April 2012. 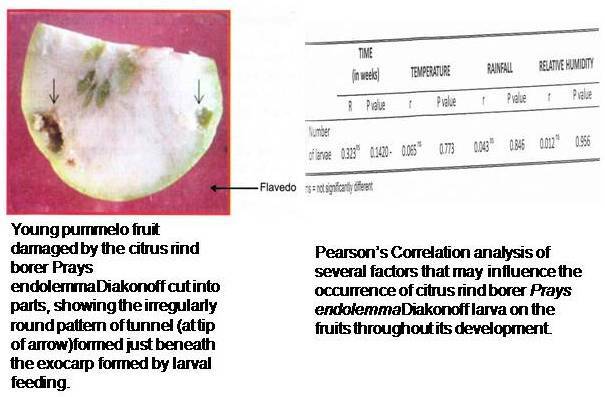 Citrus rind borer (CRB) is a major threat to pummelo, particularly in Region XI. The egg hatches in 3-4 days. The larva spends 13 to 15 days in the pummelo rind before it comes out to pupate on the leaves or twig. The adult emerges from the pupalcase in 4 days. The egg is flat, almost circular, and laid singly on the surface of the pummelo fruits as early as fruit setting. The larva when fully mature is dark to light green in color with its prominent red stripes. The pupa is enclosed in a lacelike, large-meshed cocoon. Adult is generally gray brown in color with dark brown markings. Dissected female genitalia shows distinct ductusbursae with short tubular upper third and sclerotized wide lower part formed by two broad sclerites (cestum), each bearing a dentate ridge the species was named after, Prays endolemma Diakonoff. 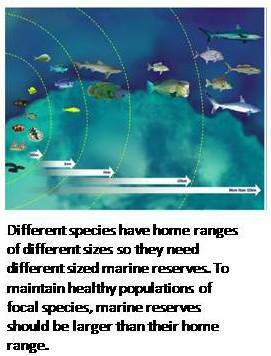 Designing Marine Reserves for Fisheries Management, Biodiversity Conservation, and Climate Change Adaptation. Coastal Management, 42 (2): 143-149, March-April 2014. This paper reviewed ecological considerations for marine reserve design to address fisheries management, biodiversity conservation, and adaptation to climate change. These include habitatrepresentation; risk spreading; protecting critical, special and unique areas; reservesize, spacing, location, and duration; protecting climate resilient areas; and minimizingand avoiding threats. Pattern of Infestation and Characteristic Damage of Citrus Rind Borer Prays endolemma Diakonoff (Lepidoptera: Yponomeutidae) on Pummelo Citrus maxima (Burm) Merr. (Rutaceae) in Region XI, Philippines. Philippine Entomologist, 26 (2): 137-155, October 2012. The citrus rind borer (CRB) Prays endolemmaDiakonoff is the major insect post of pummelo in Region XI. Infestation occurs at flower bud formation until early fruit development or approximately 21 days after fruit set. Out of 83 flower buds monitored for onset of CRB damage, 35 were found infested about 6 days after fruit set and subsequently fell off the trees. Among the remaining 48 buds that developed into fruits, only 27 matured and were harvested. All the fruits were infested with CRB and the rind was marred by lumps in areas where the developing larvae were feeding from. When the fifth instar larva exited through a hole in the lump, sticky exudates oozed out and tissues surrounding the exit hole became necrotic. Moderately damaged fruit, at harvest, was characterized by presence of lumps, feeding tunnels that had healed and did not reach the pulp, and at times, formation of extra core. Severely damaged fruit had soft, watery pulp. The most critical period to employ control measures is from flower bud formation until three weeks after fruit set. The Forest Types in Aborlan Guba System, Palawan Island, Philippines. IAMURE International Journal of Ecology and Conservation, 7: 88-104, July 2013. Four vegetation types were distinguished in the Aborlan Guba system. Results clearly revealed that elevation, air temperature, moisture content, water holding capacity, pH and potassium level of the soil, and human disturbance significantly influenced the spatial distribution of tree species. Impact of human activities was inversely proportional to species richness. This is critical since the area is encroached by the locals. It is best to classify the whole area as a Core Zone for its immediate protection. 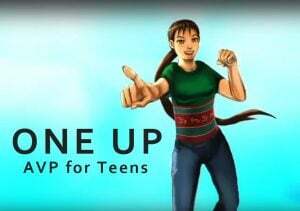 Declaring it as a Protected Area under the NIPAS law ensures the long-term protection of the indigenous system that would generate ecosystem services for the community residents. Floristic Composition and Physiognomy of Pagbilao Magngrove, Quezon Province, Philippines. 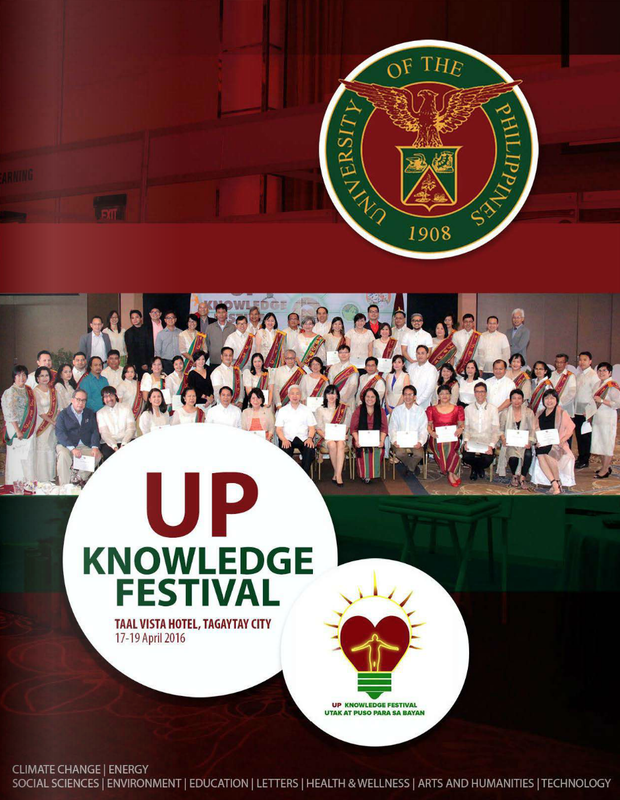 IAMURE International Journal of Ecology and Conservation, 7: 25-39, July 2013. A total of 37 species were identified in the study area in Pagbilao Mangrove Ecosystem in Pagbilao, Quezon, south of Manila. The mangroves plant species comprise 744 individuals belonging to 28 genera and 18 families of useful plants. Using Shannon Index of diversity, the landward zone has the highest diversity followed by the seaward zone. The least diverse was the middle ward zone. There was a similar trend in the proportion of various tree heights and diameter in seaward, middleward and landward zones. The density of small trees was higher than those of the big ones. It appears that higher diversity in the landward and seaward zones indicate unstable conditions caused by disturbances that normally frequent the area. Communities abound around the vicinities of the important landscape. People are utilizing mangrove resources and there will come a time, that if unguarded, utilization may go beyond the limits and become detrimental already to the system. With the satoumi framework in place, there is much hope in the conservation and management of this mangrove ecosystem. High Performance Silicon-based Anodes in Solid-state Lithium Batteries. Energy & Environmental Science, 7 (2): 662-666, February 2014. Silicon–lit hium alloys are one of the most attractive anode materials for next-generation lithium-ion batteries; however, they have demonstrated high performance, only when they are fabricated into nano-sized materials. Herewe show that even bulky alloys exhibit high potential that has never been shown in conventional liquid electrolytes, when they are in solid electrolytes. Nanograined Sc-doped BaZrO3 as a Proton Conducting Solid Electrolyte for Intermediate Temperature Solid Oxide Fuel Cells (IT-SOFCs). Solid State Ionics, 264: 1–6, 15 October 2014. 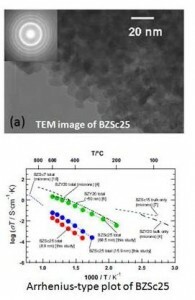 Nanograined 25 mol% Sc-doped BaZrO3, BaZr0.75Sc0.25O3-δ, well-known as a proton conductor, has been successfully synthesized at low processing temperature with average grain sizes of 8.9 nm, 15.9 nm, and 68.5 nm, and the effect of grain size on the conductivity has been examined. X-ray diffraction (XRD) and selected area electron diffraction (SAED) patterns for these samples suggest a simple cubic perovskite type structure. The total DC conductivity, bulk and grain boundary contributions, of BaZr0.75Sc0.25O3-δ as-pressed at room temperature (non-sintered) is 5.53 × 10-6 S/cm (8.9 nm grains) at 500 °C, while values of 2.68 × 10-5 S/cm and 1.27 × 10-3 S/cm are observed at 500 °C for those samples post-annealed at 800 °C and 1250 °C with average grain sizes of 15.9 and 68.5 nm, respectively. The observed total DC conductivity for 68.5 nm grain size is almost comparable to that reported for benchmark Y-doped BaZrO3 with nanometer and micrometer grains. Updates on the Status of Giant Clams Tridacna spp. and Hippopus hippopus in the Philippines using Mitochondrial CO1 and 16s rRNA Genes. Journal of Natural Products, 77 (5): 1224-1230, 2014. 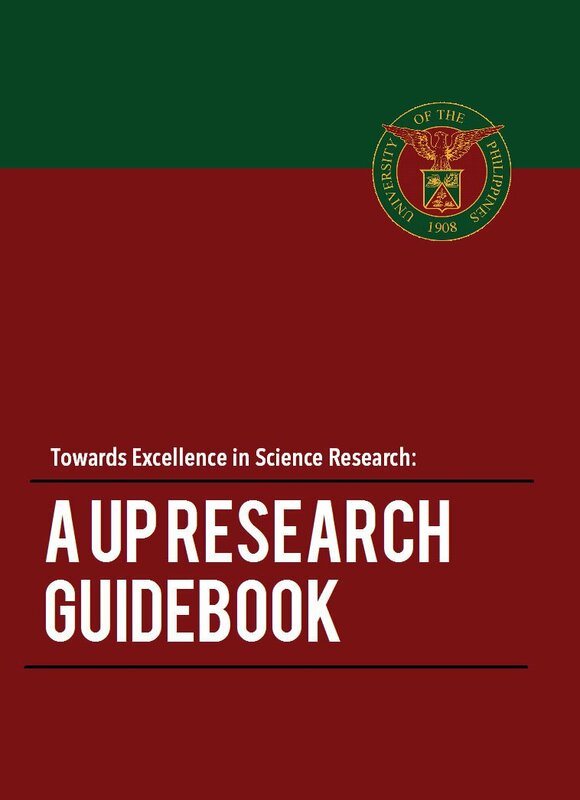 Six of the possible eight species of giant clams (Hippopus hippopus, Tridacna gigas, T. crocea, T. squamosa, T. derasa,and Tridacna sp.YCT-2005)under the Tridacnidae family found in the Philippines were sequenced for molecular approach-based species identification. We first reported here the CO1 sequence of H. hippopus and made it available online through GenBank. We also reported the first sighting of Tridacna sp. YCT-2005 in Philippine waters, an undescribed species of giant clam, which has initially been reported to be a potentially new species that was thought to be found only in Taiwan. This study confirmed the identification of giant clams found in the Philippines using molecular techniques. The use of DNA barcoding can be a useful tool to properly identify different species of giant clams which is substantial for their proper management and conservation in the Philippines, since they are all declared as endangered species. Griseorhodins D–F, Neuroactive Intermediates and End Products of Post-PKS Tailoring Modification in Griseorhodin Biosynthesis. Journal of Natural Products, 77 (5): 1224-1230, 2014.
cement of calcium uptake in a mouse dorsal root ganglion primary cell culture assay. 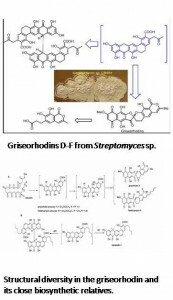 Two of these compounds, griseorhodins D1 and D2, were shown to be identical to the major, previously uncharacterized products of a grhM mutant in an earlier griseorhodin biosynthesis study. Their structures enabled the establishment of a more complete hypothesis for the biosynthesis of griseorhodins and related compounds. The other two compounds, griseorhodins E and F, represent new products of post-polyketide synthase tailoring in griseorhodin biosynthesis and showed significant binding activity in a human dopamine active transporter assay. Structure and Activity of Lobophorins from a Turrid Mollusk-Associated Streptomyces sp. Journal of Antibiotics, 67: 121–126, 2014. There is an urgent need for new antibiotics to combat the rise of resistant strains. As an important example, Mycobacterium tuberculosis infects 1/3 of the global population and kills 1.4 million people annually. Symbiotic bacteria from animals provide a good and relatively untapped source of new natural products, but obtaining diverse, novel animals can be time consuming and expensive.We have employed an approach to easily access a large diversity of mollusks, lumun-lumun. This method, invented and widely used by fishermen in the central Visayan region of the Philippines, involves placing bundles of nets (lumun-lumun) in the sea for 1–6 months. When the nets are harvested, they are found to contain a large abundance and diversity of micromollusks, which are valuable to collectors. In addition, the obtained micromollusks are often novel species, previously unknown to science. Turrids are the most speciose of the cone-related mollusks. Ongoing research shows that, like cone snails, each turrid contains a wealth of novel venom peptides that are neuroactive and potentially have other activities. In particular, a new species, Lienardia totopotens, was found in a lumun-lumun net, dissected and used to obtain novel venoms with potential in drug discovery. 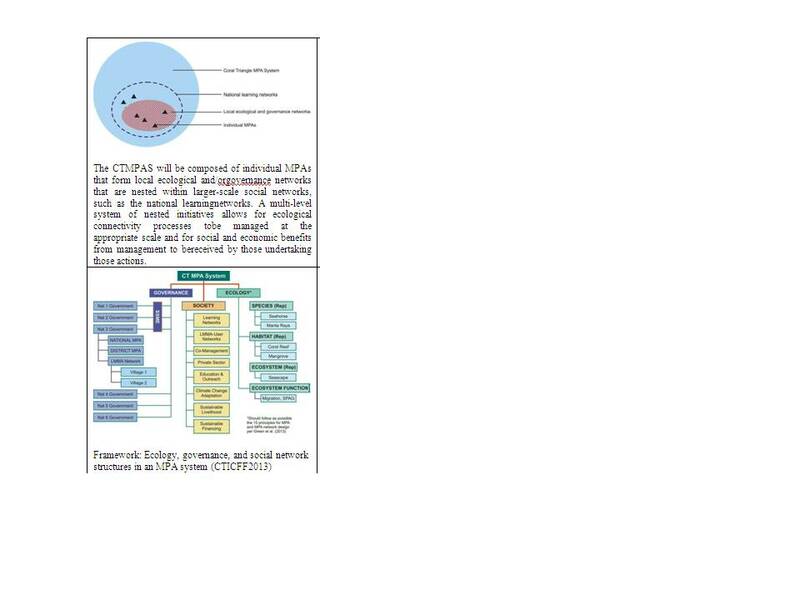 Here, we report a series of less novel compounds, which are in fact relatively trivial new derivatives of the lobophorin series.17–20 These compounds were inhibitory to Bacillus subtilis, M. tuberculosis and human cell lines, but not to Pseudomonas aeruginosa or Burkholderia cepacia. Establishing a Functional Region-Wide Coral Triangle Marine Protected Area System. Coastal Management, 42 (2): 107-109, February 2014. Thi s paper details the Coral Triangle Marine Protected Area System of Framework and Action Plan. 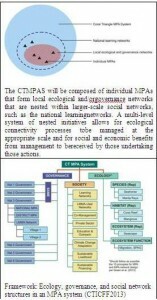 The MPA System Frameworkcontains guidance for standardizing how MPAs and MPAnetworks are evaluated for effectiveness, and provides options for scaling-up existingMPAs to networks of MPAs that are more ecologically linked, integrated with fisheriesmanagement and responsive to changing climate. 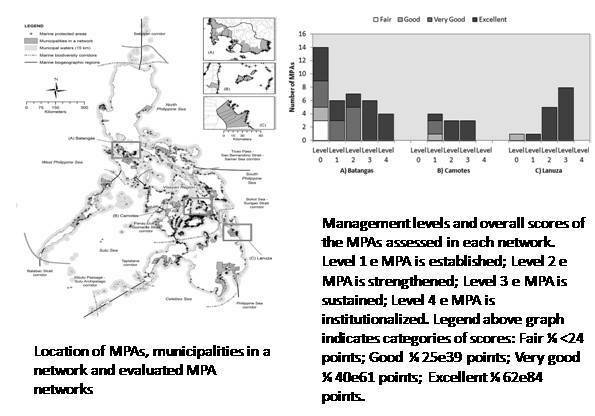 Evaluating Management Performance of Marine Protected Area Networks in the Philippines. Ocean & Coastal Management, 95: 11–25, July 2014. Performance of three Marine Protected Area Networks were evaluated using a combination of quantitative and qualitative survey tools. We found that ourapproach improved overall evaluation of the performance of MPA networks and individual MPAs.Moreover, our analysis for each MPA network showed different combinations of outcomes, highlightingthe importance of using a suite of research methods and tools. 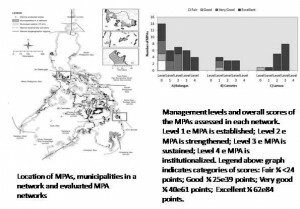 We found that MPA networks furtheredthe development and effectiveness of spatial management in the Philippines. 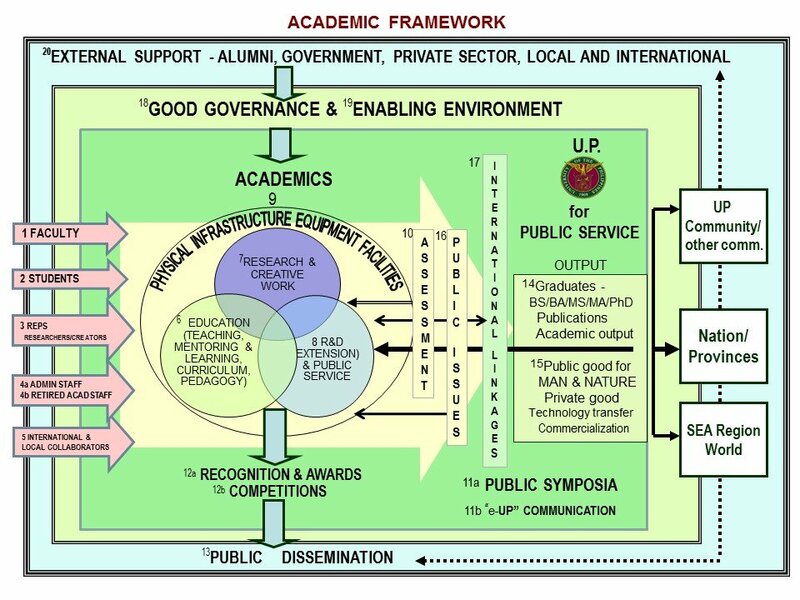 However, the objectives of the collaborative partnerships, their histories, and the diversity and complexity of governance had a mixed effect on the managementof networks and of individual MPAs.